Fearscape #4 is out 2/13/2019. By Zack Quaintance — I don’t entirely know what’s up in Fearscape. So, before reading Fearscape #4, I went back and re-read this series from its start, seeing if I’d missed any clues. I came back with a few things, but on the whole, I didn’t develop great theories about what’s happening or why. Certainly not any I’m confident enough to lay out here, dear readers (sorry, I really did read a whole lot of Fearscape today). Before unpacking my re-read, let me say this is a strong ambitious comic. Artist Andrea Mutti and colorist Vladimir Popov’s designs are top-notch, as is their delineation of the Fearscape from reality. There is (likely intentional) confusion over meaning, but it is always clear when a character is fantastical or real, unless it serves the story to blur lines. Writer Ryan O’Sullivan does impressive work maintaining the insecure pretentious voice of faux-literary luminary, Henry Henery. I’ve tried complex voices like his myself—maintaining a consistent tone for four issues is truly impressive. Now, on to my re-read. Two ideas stand out in this idea-dense comic. The first is the tearing down of usual story structure. The second is the culpability of readers in stories, ie if I’m not turning pages, nothing happens to characters, like Schrodinger’s fiction. The many references to these thoughts make me suspect disorientation is by design, and the real villain of this comic is stories in the first place, especially those of literary figures who thrive on validation for cleverness. Interior artwork from Fearscape #2. Conversely, there are ample references here to the learned reader versus the casual reader. The learned reader is, presumably, someone with a handle on what’s happening and how various meta-fictional touches are being deployed. This person maybe even knows why. The casual reader, meanwhile, is someone yearning for the predictable comfort of a Campbell hero’s journey, a story about a person—good or bad—who wants something, struggles, and emerges changed...often for the better. In Fearscape, the casual reader is derided by Henry Henry, perhaps more than anything (which is saying a lot because this guy derides all damned day). The book is without question succeeding on disregarding conventions and discomforting casual readers. What remains to be seen, however, is if it uses that to tell an engaging story that raises questions about the art life and—in a broader sense—the human condition. 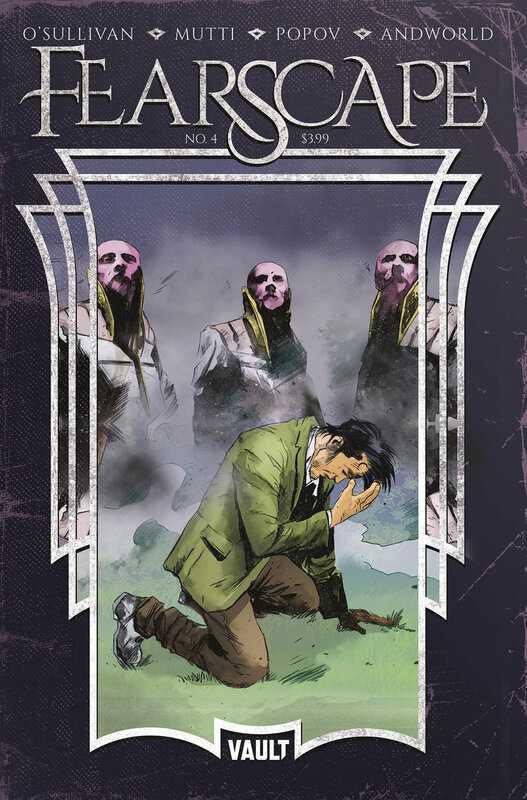 To me, Fearscape #4 feels like a deepening psychological nightmare, a trip into the mind of a writer riddled with anxiety and imposter syndrome and desperation, having spent his career compartmentalizing personal ambitions while translating other work. There are, however, elements that suggest a further skewing of reality...Henry not having parents but being Arthur’s ward, Arthur and his alzheimer's, Henry Henry telling us he’s dead. These suggest a deeper story, one I have not yet figured out but remain absolutely determined to experience.